Māori have a long history of protest, over issues ranging from land loss and language revival to exclusion from rugby tours of South Africa. Acts of protest have included Hōne Heke repeatedly demolishing the Kororāreka flagstaff, Parihaka residents disrupting surveys of confiscated lands, the 1975 hīkoi (land march) to Parliament, and Ngāti Whātua’s 506-day occupation of Bastion Point. Māori have a long history of protest. Hōne Heke four times cut down the flagpole that flew the Union Jack in Kororāreka in the Bay of Islands, in 1844–45. In the 1880s protesters from Parihaka, Taranaki, disrupted surveys of confiscated land. Through the late 19th century Māori petitioned Parliament over land grievances, and some went to England to present grievances to the monarch. In the 1890s Māori protesters obstructed Pākehā trying to open the spit across the mouth of Lake Ōnoke in the Wairarapa. More protests emerged in the 1960s, alongside protest movements over women’s rights and the Vietnam War. The first Waitangi Day protests at Waitangi were organised by activist group Ngā Tamatoa in 1971, and remain a regular occurrence. In 1975 the Waitangi Tribunal was set up to investigate breaches of the treaty. Early land protests included petitions, land occupations and destroying survey pegs. Pan-tribal movements such as the Kīngitanga (King movement) and Kotahitanga (Māori parliament movement) were set up to advocate for land issues. In 1975 Whina Cooper led a hīkoi (march) from the far north to Parliament to protest over land loss. Ngāti Whātua occupied their former lands at Bastion Point, Auckland, for 506 days in 1977–78. Their lands were later returned. Protesters have also occupied lands at Raglan, Pākaitore (Whanganui) and Ngāwhā. In 1960 there were protests over a decision to exclude Māori players from an All Black rugby team touring South Africa. There were more protests over Māori and Pacific Island players being considered ‘honorary whites’ for the 1970 tour. Protests against the South African Springbok team’s tour of New Zealand in 1981 were the largest in the country’s history. In 1972 a petition to have the Māori language taught in schools, signed by 30,000 people, was presented to Parliament. In 1979 a Māori group stopped Auckland University engineering students performing a mock haka. In the 2000s protesters successfully attempted to have the tino rangatiratanga flag (which became the national Māori flag) flown on the Auckland Harbour Bridge. 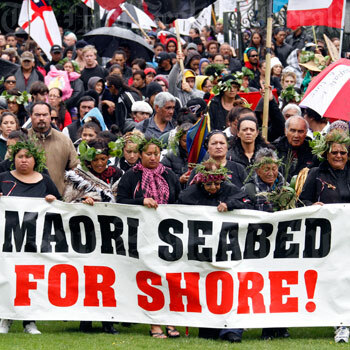 the Foreshore and Seabed Act 2004, which overturned a court ruling that Māori could claim customary rights to the foreshore and seabed.